 From the July 2018 Desktop News | Dr. Ryan Earley, an associate professor of biological sciences, has been collecting bottle caps for the last three years. He has hundreds of thousands of them, and though the caps have virtually no monetary value, Earley and students from UA’s Marine Science Club have been using them to create murals that bring attention to the impact of pollution on biodiversity. Earley’s collection boasts of hundreds of thousands of caps in every color. The murals, originally displayed at the Blue and Green Sustainability Gala at the Alabama Museum of Natural History last year, were recently moved to the Dauphin Island Sea Lab, where they are on permanent display. 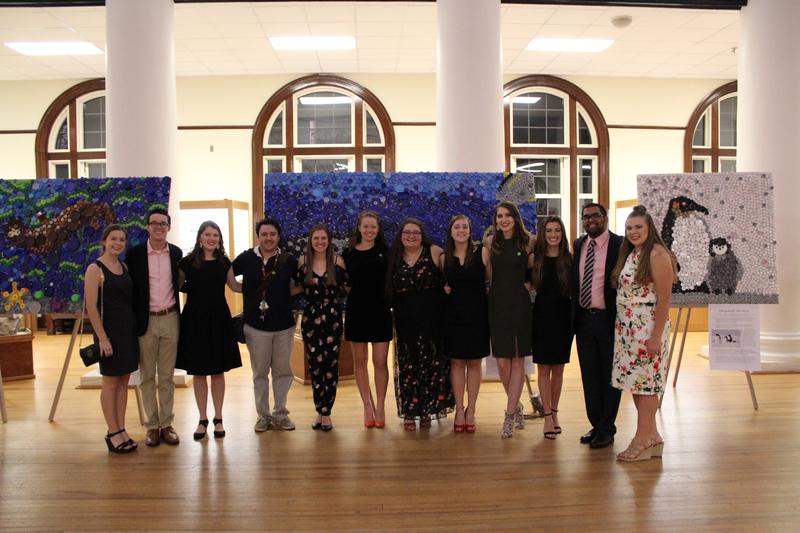 “Believe it or not, the murals were a year-and-a-half long project,” said Blair Morrison, president of the Marine Science Club. “After pitching the idea to Dr. Earley and figuring out logistics, we spent a month or so just sorting bottle caps by color. The murals depict animals—including anglerfish, penguins, seahorses, whale sharks, sea turtles, and sea otters— that are disproportionately affected by plastic pollution and climate change. Each of the six murals depict an animal or habitat disproportionately affected by plastic waste. 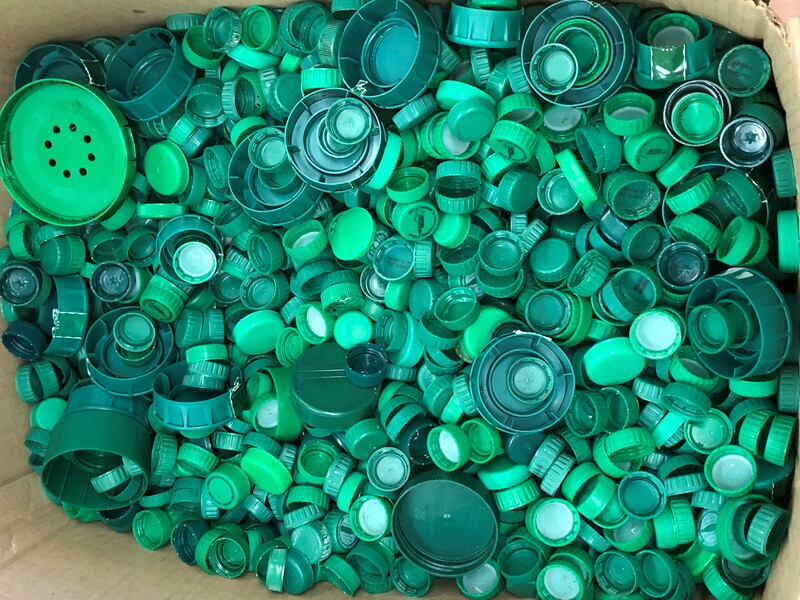 The bottle caps, which are notoriously difficult to recycle, came from all over campus. Earley initially asked students in his classes to donate caps, and eventually he received donations from across the department and the college. 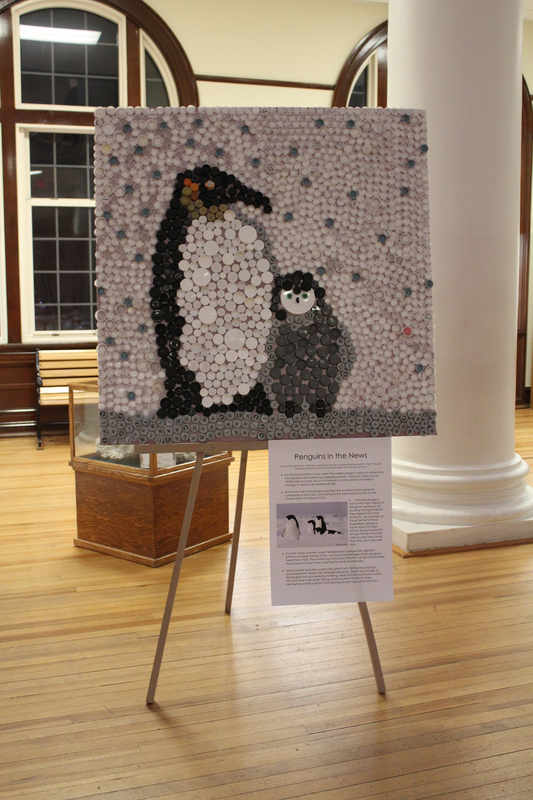 The caps fill roughly 20 boxes in the fourth floor of the Biology Building, and Earley says the six murals created by the Marine Science Club barely made a dent in the total collection. The Marine Science Club at the Blue and Green Sustainability Gala. Why so many caps? Earley explained that he originally conceived of the project in conjunction with his twin sister, who was an artist and educator in New York City. Together, they hoped to work with local kids and teachers to create a 20-by-20 foot mural depicting Charles Darwin’s first evolutionary tree with the phrase “I think” over it. “The goal was for people to stop and think about how they can make their footprint smaller and, in doing so, perhaps help curtail the loss of biodiversity,” Earley said. Though the New York City project is on hold, UA’s Marine Science Club devised a list of eight things you can start doing today to help the environment and decrease your ecological footprint. Eat Less Meat: By reducing the number of times a week that you consume meat or other animal production, you can greatly reduce your ecological footprint. Industrial agriculture is responsible for nutrient pollution around the world and accounts for a significant portion of methane production. Wear Natural or Recycled Fabrics: Fleece and other synthetic fabrics easily fragment into microplastic fibers. These make their way into waterways from your washing machine and may even end up in your tap water or food. Carpool or Take Public Transportation: This simple step reduces the number of fossil-fuel-burning vehicles present on the roadways. Eat Local: Buying local produce ensures that whatever fruits and vegetables you buy are in season; this decreases the need to transport out-of-season produce to your area. Make Your Home Energy Efficient: Install energy efficient LED lightbulbs and make a conscious effort to reduce energy when setting the thermostat. If you have old appliances, consider replacing them with newer, more efficient models. Don’t Use Single-Use Plastics: Single-use plastics are one of the worst things for our environment. Many of them don’t break down for hundreds of years, and some leach toxic chemicals in their degradation process. Stop using straws, plastic water bottles, and plastic shopping bags. Instead, use biodegradable versions of single-use items or invest in reusable ones. Support Renewable Energy Sources: Explore ways to use non-carbon-based sources like solar or wind energy. Support Sustainable Initiatives: Buy sustainably harvested coffee, chocolate, paper products and fish. Sustainable harvests ensure that the earth can replenish the resources that are taken from it—safeguarding resources for future generations.